G-858 MagMapper – Utility Mapping Services, Inc.
G-858 data acquisition offers either continuous or discrete station recording. 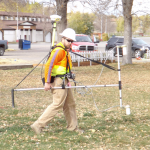 The high sampling rate of the instrument in continuous mode allows the operator to survey an area at a fast walking pace. A wider search zone can be achieved by adding a second sensor. Adding a second sensor also provides the ability to measure the magnetic field gradient. The G-858 is designed to interface easily with standard computers and peripherals. Geometrics encourages clients to provide their own processing computer hardware.